On January 14, 1938, the day after the animated feature Snow White and the Seven Dwarfs had its East Coast premiere at Radio City Music Hall, Kate Cameron of the New York Daily News published a glittering review alongside an image of Snow White and her bird friends chasing the hag out of the Dwarfs’ cottage. The review was simply glowing, calling the audience “spellbound,” while noting that mostly adults attended the screening and were enraptured with the animated performances. The review also notes the music as “excellent,” the adaptation as “delightful,” and the voices having been selected “judiciously.” The film was awarded four stars for children, and four stars for adults. Posted in Uncategorized and tagged 1930s, Animated Feature Film, Newspaper, Publicity. Bookmark the permalink. On July 9, 1955, an article ran in the New York Times about the soon-to-open Disneyland theme park. Entitled “Disneyland Gets its Last Touches,” the article focused on Walt Disney’s vision for a brand new type of amusement park, to which the article wrote “For its appellation ‘amusement park’ is inadequate, for it has no banalities as roller coasters, Ferris wheels, and dodge-‘ems in a milieu of honky-tonk.” This was one of many articles used to promote this new type of park, which was seen as very different from the amusement parks of its time. Posted in Uncategorized and tagged 1950s, Disney Park, Disneyland Park, Newspaper, Publication, Publicity. Bookmark the permalink. On February 7, 1938, the daily newspaper comic strip for Donald Duck began publishing. Four years after his premiere in the Silly Symphony The Little Wise Hen, the series was first written by artist Al Taliaferro, who had worked on the Silly Symphony comics in the newspapers. Taliaferro lobbied hard for Donald to get his own strip, and after a lot of hesitation from Roy Disney and the comic department, Taliaferro was allowed to make Donald a solo star in the Silly Symphony comics. 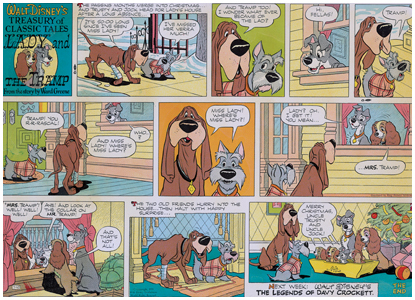 These strips were popular enough to be collected in a 64-page comic book from Western Publishing; the book itself surprised everyone with the high number of sales. 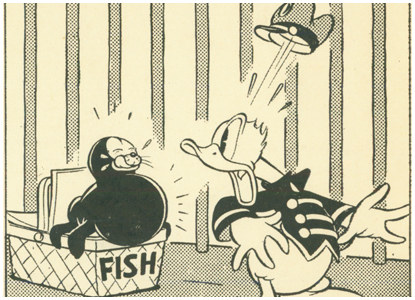 This first strip in the Silly Symphony comic to feature Donald, and begin the comic career of the duck, has a plot similar to the Mickey Mouse short film Mickey’s Circus, where Donald is trying, and failing, to command the trained seals. Posted in Uncategorized and tagged 1930s, Black and white, Comic, Donald Duck, Newspaper, Popularity. Bookmark the permalink. On July 10, 1955, the character Scamp appeared in the Disney comic strip series Disney’s Treasury of Classic Tales, which was used to promote upcoming Disney films. The strip on this day was promoting the film Lady and the Tramp, with Scamp appearing in the final panel as one of Lady and Tramp’s puppies. Although not named in the film nor this strip, the character was given a name in October of that year, when he began appearing in his own daily strip which ran until 1988. Posted in Uncategorized and tagged 1950s, Character, Color, Comic, Newspaper, Popularity. Bookmark the permalink.